The holiday season is upon us, magpies, and that means one thing: we're all shopping like mad! Today, I've partnered with StyleRocks, the Australian jewelry company that specializes in custom-made pieces, to bring you a holiday shopping guide with a royal jewelry twist. 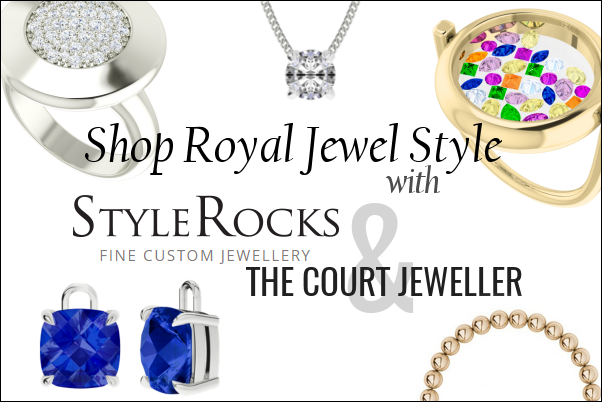 Many of you will be familiar with StyleRocks through the giveaways they've sponsored here at The Court Jeweller in the past. And I've gotten great feedback from those of you who have shopped with the company. 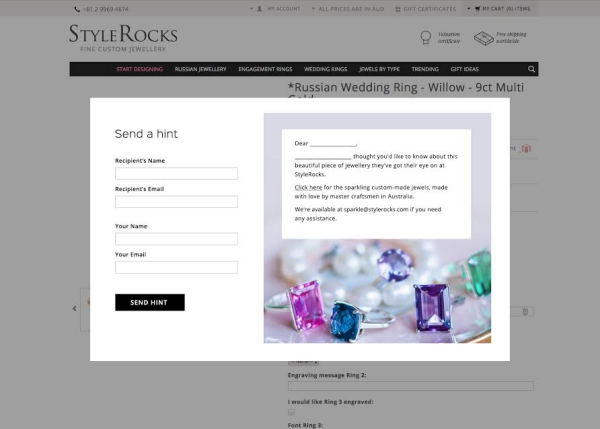 In fact, StyleRocks prides itself on maintaining a 100% satisfaction rate with their customers -- something I think is extremely important where jewelry is concerned! 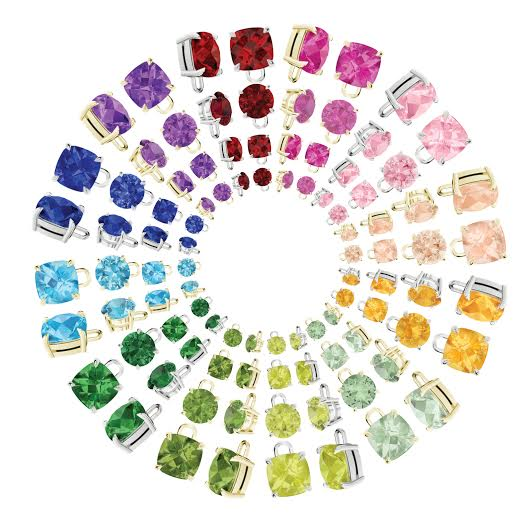 This holiday season, StyleRocks is offering its customizable jewels -- including their rainbow of detachable drops! -- on installment pay for the first time, helping you to fit a few glittering jewelry purchases more seamlessly into your monthly budget. You can custom-order your pieces to fit with your style and the needs of your jewelry box: choose from various gemstones and metal finishes to create a completely custom look! For orders of $500 AUD or more, you'll also receive a valuation certificate, so you can be certain that you've received exactly what you've ordered. And even better, the company ships internationally with delivery through DHL Express. To help you wade through the immense offerings that StyleRocks has on their website, I've put together a couple of royal jewel-inspired shopping guides, with some of our favorite royal ladies as inspiration. Do you love Maxima's festive jewels? Are you more into Letizia or Rania's modern, edgy styles? Do you favor classic pieces like Kate and Mary? Check out some of the StyleRocks options that fit best with your royal jewel style! If you like a bit of fun and frivolity, Queen Maxima of the Netherlands is probably your royal jewel style soulmate. Argentine-born Max wears jewelry with unmatched exuberance. Her bold, fun style includes oversized pieces, bright colors, and dazzling diamonds. The unexpected size of the South Sea Pearl Necklace on Sterling Silver Chain adds a twist to a classic piece. The bright pink shade of the Four Stone Oval Pink Sapphire Bangle in yellow gold pops against neutrals and vivid colors alike. And how much fun is the Rainbow Gemstone Glass Ring in 9 carat yellow gold? Colorful slivers of gemstones move about within the glass ring as you move -- it's almost as much a plaything as it is a piece of jewelry! For those of you who like a bit more edge with your bling, Queen Rania of Jordan probably has your favorite royal jewel style. Rania combines on-trend pieces with classic diamonds, mixing patterns and textures for a bit of extra interest. With its combination of cool silver and warm amber, the Amber Sterling Silver Pendant would definitely fit with her love of mixed materials. A pair of trendy back-to-front baubles like the Double Pearl Tribal Earrings in rich black would feel right at home in her jewelry box. And the Diamond Raindrops Ring in 9 carat white gold mixes classic diamonds with an ultra-modern setting for a little extra visual excitement. If you love elegant classics mixed with warm, natural motifs, you probably love the jewelry style of the Duchess of Cambridge. Kate pairs staples like pearls and diamonds with unexpected design motifs found in nature, like acorns and leaves. The Diamond Solitaire Pendant, set in cool 18 carat white gold, would add a little classic sparkle to any outfit. The Round Disc Earrings with Inset Pearls in 9 carat yellow gold are reminiscent of a pair Kate's been wearing recently, but with a bit of a drop twist. And the Terre et Mer Two Leaf Necklace in 9 carat yellow gold would fit right in with Kate's collection of golden jewelry with natural designs. Queen Letizia of Spain might be your royal jewelry style match if you love modern design punctuated by pops of unexpected color. Letizia keeps her jewelry to a minimum, but the pieces she wears often add quite a lot of punch to her streamlined look. The White Pearl Sterling Silver Drop Earrings are similar to a pair that she favors for everyday wear. The Blue Sapphire Sterling Silver Checkerboard Earrings would coordinate nicely with Letizia's existing collection of detachable drops. And although she doesn't often wear rings, the full Diamond Woven Ring in 9 carat white gold is just the kind of bold, glittering statement she likes to wear on her hands. If you love sophisticated, Scandinavian style, Crown Princess Mary of Denmark's jewelry is surely right up your alley. Mary loves to combine cool, Danish classics with surprising moments of color and design. The Double Halo Pavé Diamond Studs in 18 carat white gold add just the right amount of glamour and sparkle both day and night. The Lapis Lazuli Sterling Silver Cabochon Cocktail Ring is a classic constellation of gorgeousness that manages to surprise with its size. And who wouldn't love the way that the Rose Gold Bead Bracelet in 9 carat gold would shine and roll at the wrist? Which royal jewelry style is most like yours -- or most like the person you'll be shopping for this season? Disclaimer: This post was sponsored by StyleRocks.